A little while ago we updated our post auction pages to be more clear about what your next steps should be when you win or sell an item. Missing from that was support for local pick up exchanges … until today! Local transactions remove a lot of the friction that’s involved with shipping and we want to help make that exchange even easier. To help do this we’ve created a separate post auction flow where a seller can save and send their preferred meetup address and phone number. 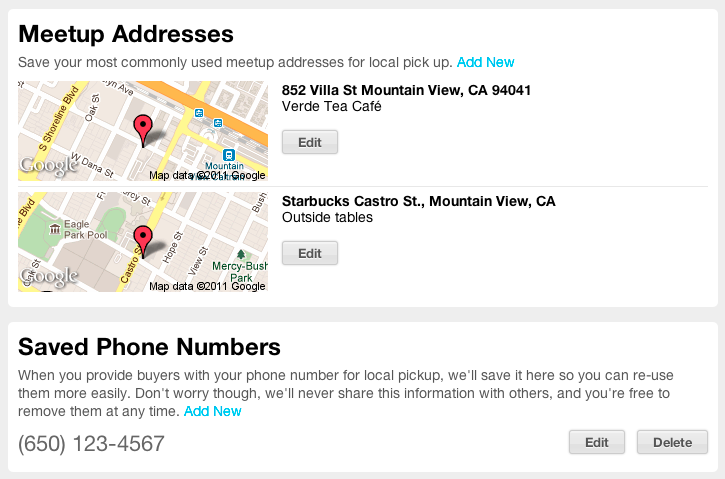 Saved information can be used over and over if you repeatedly meet up with people near you to exchange items. The new steps after an auction ends are very similar only now there are a new set of features for local pick up. Take a look at the screen shots below for more details. If you want to read more tips, visit our support page. When an auction ends where the seller has offered both local pick up and shipping options, the buyer’s first step will be to choose which one they would like to use. The seller will get an email stating the buyer would like to pick up the item locally and when they visit the auction page they’ll be able to send their preferred meetup information. This information is then sent to the buyer for reference. All other correspondence can still be done via our messaging system. To manage your meetup information go to your account settings page. Post auction flow for shipping items should still remain the same. If you haven’t tried a local pick up auction now is your chance! 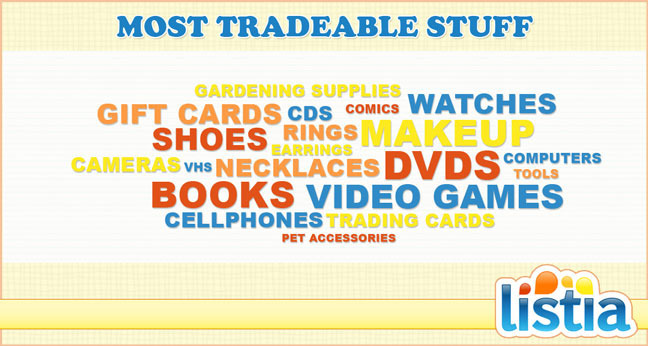 Save on shipping costs and get rid of big heavy items that you could never ship like furniture! Giving away free stuff should be easy. Like many great ideas, Listia was built as a solution to a messy and frustrating problem. A few years back one of our cofounders, James, posted old snowboard boots in craigslist’s free category, thinking he could quickly clear them out of his closet while earning himself good snow karma. His inbox immediately filled up with inquiries, and he found himself juggling multiple conversations, questions, schedules and levels of interest. After carefully selecting one person and politely notifying all other parties, James anxiously waited at home with his boots for the pickup. He waited, and waited. And then waited some more. When he realized his chosen recipient had actually flaked, he threw his hands in the air in frustration. Giving away free things should never be this difficult. What are your favorite things about Listia that other sites just don’t provide? For most couples, a wedding culminates months of dreaming, planning and in large part, spending. The money savvy folks at Adaptu estimate Americans drop a staggering average of $24,877 per wedding. However, one thing they missed in their calculations are costs that can be recouped after the big day passes. Congrats to all the 2011 newlyweds! Since our launch in 2009, thousands of companies have joined our mission to change the way we consume goods and services. Instead of buying new things in isolation, people can now turn to local and online communities to share, trade and rent just about everything. From books to clothing to cars to apartments and even childcare–collaborative consumption is making our environment and wallets a bit greener. A popular form of measure among sharing communities is “idling capacity”, or the social and economic value of under-utilized spaces, skills and stuff. Stop for a moment to look around. How many items in your home go unused? We have a new tool feature we want to share with all of you. Starting today, users will be able to optionally create custom subcategories that can help better categorize your listing. The purpose of the custom subcategory tool is to provide a more descriptive listing and increase relevance when browsing. 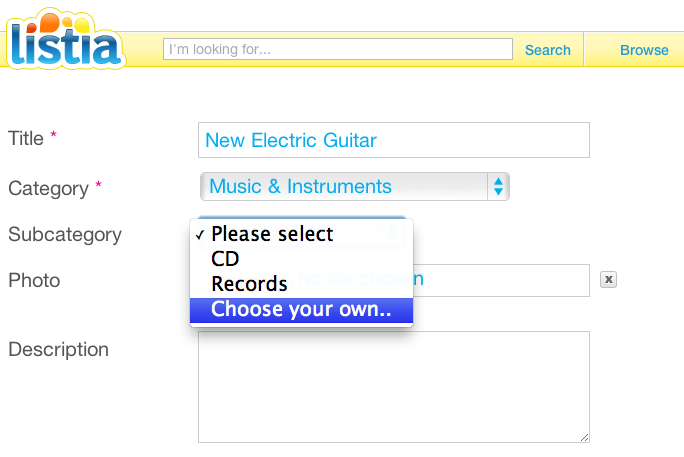 For example, under the Music & Instruments category, you will only find the fixed ‘CD’ and ‘Records’ subcategories. 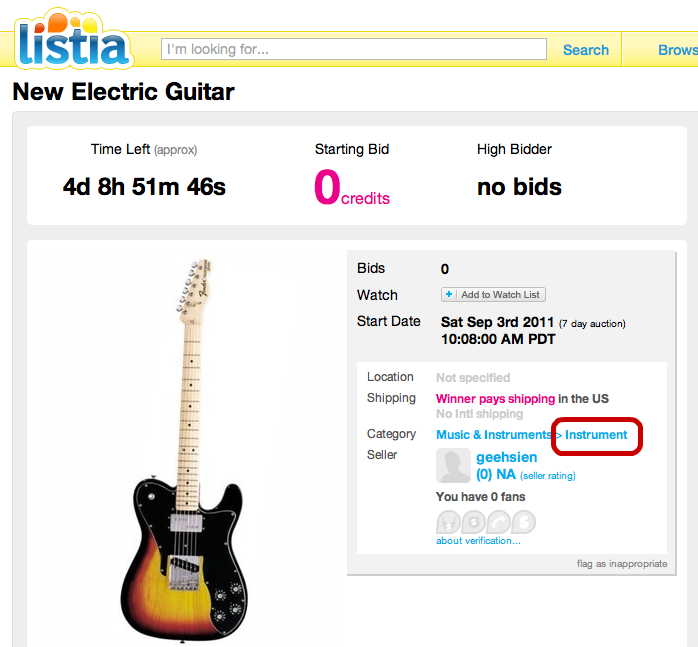 Previously, if you had a guitar, there would not have been a subcategory relevant to your listing. 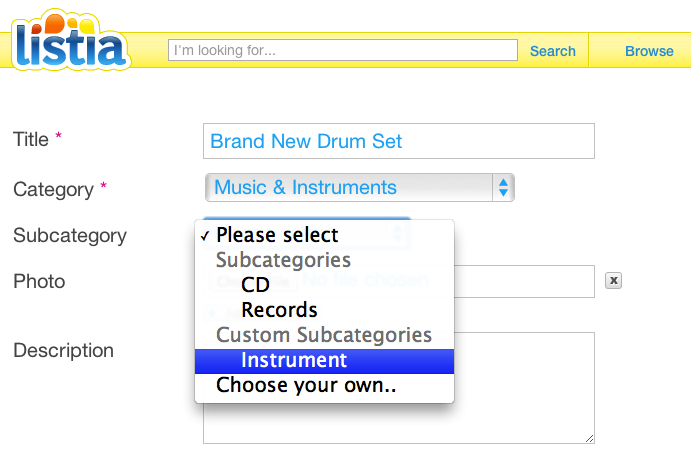 But now, users can create a custom subcategory called “Instrument”, resulting in a more descriptive listing. Over time, the most commonly used custom subcategories will be evaluated and included into our fixed subcategories as needed. To use this tool, simply go to the List Auction page. Under any category, you will be able to find the Subcategory drop down menu. First look to see if the current sub-categories are relevant to your item. If not, you can click on “Choose your own” and enter your custom sub-category label. Using the earlier example, you create a custom subcategory called “Instrument” to further describe your listing. Once you have created the custom subcategory and finished your entire listing, click “Submit” and you will find your new subcategory in your listing page. All users will have the ability to use your custom subcategory for their future listings. NOTE: Custom subcategories are optional and are to be used for descriptive purposes only. Custom subcategories are to help better categorize your listing so misuse of this tool (e.g. irrelevant word/phrase, providing profile information (seller feedback, free shipping offerings, location) etc) is not allowed. 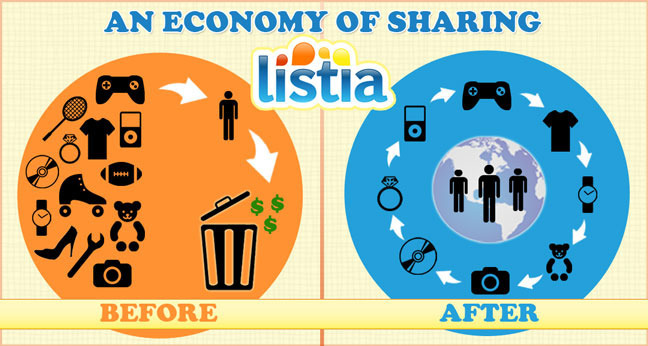 Listia reserve the rights to remove a custom subcategory if we find users misusing this tool. Any abuse of this feature will and can result in listing removal, partial or permanent suspension. We hope this feature creates a better listing description and search result. What sub-categories will you be creating? Help us help you!